I’ve made pork tenderloin before many times, but it was always hard to tell when it got done, and whether it would be juicy or a log of shoe leather by the end. I also could never seem to get a nice crust on the outside. So finally I decided to get down to learning how to do it right. The recipe I used tonight came from Julia and Jacques Cooking at Home, which is a sizable compendium of classic French recipes generously annotated by both Julia Child and Jacques Pepin. 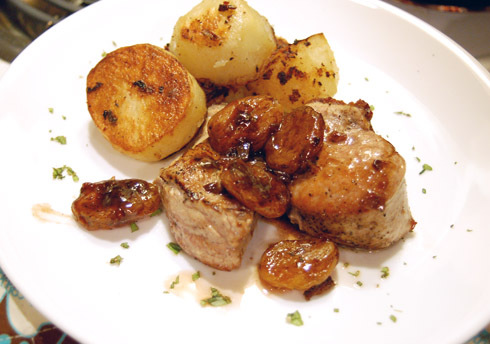 The recipe is simply called Sautéed Pork Filet or Tenderloin. It was pretty standard, following your classic “sear, bake, and make sauce” procedure. However this time around I made sure to follow the recipe to the letter. And when I deviated, I noted what went differently, why, and how I fixed it. As a result I think tonight’s pork tenderloin was the best I’ve ever made. I learned a bunch of things in the process, so I shall write them down here in case you too might find them useful. What follows is my version of the recipe, adopted from and even more thoroughly annotated than J&J’s version (if such a thing were possible). Cut the pork tenderloin into 4 equal-sized chunks and salt/pepper it. Jacques says to angle the knife differently each time so you end up more with a series of tetrahedral hunks about 2″ thick at the center, than with round discs. At first I did not know what difference this made, but I realized that this helps you actually brown the entire exterior of the meat, instead of ending up with just the top and bottom browned (as would be the case for a disc-shaped piece). Preheat oven to 350˚ F. Heat vegetable oil in pan on high heat. Here is where I began to deviate from the original recipe. First, J&J say to set the oven to 200˚. The oven is for gently roasting the pork after you sear it quickly in the pan, so the inside cooks up all juicy and tender. I found that 200˚ was too low, but this may also be my oven being an old batty apartment oven. Let’s just say you, too, have an old batty apartment oven. Go with 350, otherwise your pork will never be cooked to an edible state in time and you will end up with cold sauce in the pan waiting for it. Secondly, I accidentally used olive oil (reflex…), which was dumb. Olive oil has a low smoke point and it isn’t suitable for high-heat activities like searing… let’s just say our kitchen had an interesting haze for much of the evening. You should definitely use a vegetable oil such as canola. Thirdly, medium-high heat to me is a 7 out of 10 on my electric coil-style stove on the largest burner (8″ diameter). The different burner sizes vary significantly in heat output, so I would say, be sure to save the big burner for this step. Finally, use a non-nonstick pan because I find that nonstick pans just don’t heat up well enough. Also, you’ll never be able to deglaze it without also ripping off all the nonstick coating. I used my 9″ Cuisinart stainless steel frying pan for this. Sear the meat for 5 minutes total, turning throughout. First step to happy searing is to really heat the oil up real hot. Heat it until it gets that ripply look on the surface. This is where I often trip up because I’m impatient and the electric coils heat up super slow (I’m a gas stove kind of Tina, alas.) Then when the oil is hot, put the meat in the pan. It should hiss mightily at you. If not take the meat out and keep heating the oil, then try again. When searing, make sure your pan is big enough for at least 1″ of clearance around each chunk or else you will get steaming action and not frying. If there isn’t enough clearance, do 2 batches. One area which I personally have a lot of trouble with is knowing when to flip. I discovered that 2 minutes on aforementioned 7/10 heat is enough to get a perfect golden brown crust on the first side, but the first side only. And no peeking. Afterwards, I begin to turn the chunks every 1 minute or it starts to burn. After 5 minutes and 3 or 4 turns you should have all sides cooked to a crusty, even, golden hue. If not, you will know next time whether you should adjust the heat on your stove up or down. Lower heat to medium. Put the meat in an oven-proof dish and pop it in the hot oven. This is to finish cooking the insides, which right now is straight-up raw. At this point, set the mental timer for 10 minutes exactly. At 10 minutes, open the oven and poke the meat. If it feels completely squishy still, give it another 5. Meat should still yield a bit to the poke when you take it out. This will result in medium to medium-rare meat. (I did extensive research, a.k.a. reading the first 10 links in Google, on whether rare pork is OK. The consensus is that nowadays, it is just as OK as rare beef, as food safety standards have improved drastically since the 60s when everyone was scared of trichanosis poisoning.) In any case, 10-15 minutes will result in meat that is still a little pink in the center, but really juicy and nothing like the awful leathery stuff you get when cooked to FDA specs of 155˚ internal temperature. Totally worth the sliver of a risk of dying, if you ask me. Make the sauce: in the pan where you cooked the meat, add shallots and sauté for 30 sec. Add red-wine vinegar, stock, and port. Deglaze pan. Add apricots and reduce for 5 minutes on a gentle boil. Stir in jam and ketchup. This step is pretty self-explanatory. The jam essentially thickens the sauce into a beautiful glossy sheen, as Jacques explains in the sidebar. It’s a great trick. Look ma, no flour. Anyway, if you have everything already measured out, making the sauce will beat the roasting meat to the finish line. In which case you can turn off the heat, cover the sauce to keep it warm, and wait for the meat to finish. Use your newly emancipated attention to check up on the meat assiduously so it doesn’t get over-cooked. Take meat out of the oven, arrange on plates, and pour the yummy leftover pork juices into the sauce. Stir, pour sauce over meat, and serve! That’s it. It’s really quite easy once you figure out what your own oven/stove’s equivilant of high and medium heat are. So I guess it really comes down to practice. I’m happy to say next time I make this I’ll have this extremely verbose guide to refer to, and it just might come out as awesome as this time. PS: Yang and I have decided I should publish a book called “Difficult, Unhealthy Dinners,” along the lines of this one. Because I champion fat-and-black-bits-laden foods the world over (hey, Julia says it’s totally OK in moderation) and I seem to have a knack for making easy recipes sound hard. But I think maybe we’ve got it backwards. Many recipes that claim to be easy are actually pretty hard to master. They only seem easy because they are written with an economy of words. You can only learn by doing, for instance, that your oven temperature will be way off and the supposedly “quick” recipe will take twice as long and can no longer be relied upon to produce what it claims to be perfect done-ness. So the purpose of this book would be to make easy recipes seem hard by making them super-long, but of course in doing so they will be easy again because you will be totally prepared when your oven is way off from what it’s “supposed’ to be. And of course all of the recipes will feature ample amounts of fats, sugars, and crunchy blackened crusts. Oh yes. Wow. I think your long, involved cooking directions beat mine. I need to work harder. Thank you for the long winded directions. It came out fabulous! Thanks to your in depth description….very very good… And easy and quick.. Loved it.. You were right about the 350′.